This wonderfully relaxing complementary therapy aims to restore the natural health and vitality of your whole body, via the nerve endings in the feet. It is much more than simply foot massage. 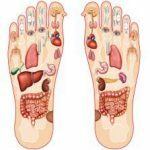 Reflexology is based on the belief that there are reflex or acupressure points on the feet, hands and ears which connect – via the nervous system – to all glands, organs and systems of the body. This is similar, in many ways, to the principle of meridian channels in Chinese medicine and acupuncture. Stimulating these reflex points through firm thumb, finger and hand pressure, sends impulses up through your entire nervous system which, in turn, affects the energy, balance and health of your whole being. Clients are amazed at how relaxed and restored they feel after a reflexology session, and also by how far-reaching its effects are.